Cut 12 thin slices of cucumber for garnish. Peel and chop the rest of the cucumber; transfer to a food processor, add rosemary and puree. Pour the puree through a fine-mesh strainer set over a medium bowl or large measuring cup. Press on the solids to extract all the juice. 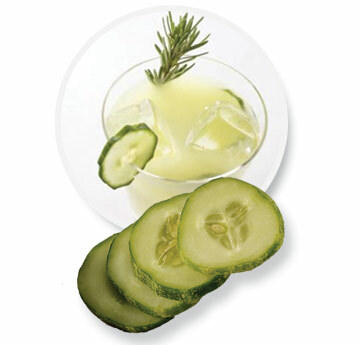 Add water, lemon juice and agave syrup to the cucumber juice; stir until the agave is dissolved. Divide among 4 ice-filled glasses. Garnish with cucumber slices and rosemary sprigs.